In just over two weeks, Brock Lesnar is set to defend his WWE Universal Championship in a Triple Threat at the Royal Rumble with the odds seemingly against him. He’ll face both “The Monster Among Men” Braun Strowman and “The Big Red Machine” Kane in a Triple Threat match with the winner walking away with the championship belt. Neither Kane nor Strowman has held this particular championship before, but both seem equally capable of winning the title. Just recently, betting odds were published for this particular match revealing how strong the chances are that “The Beast” will lose his title. In a report published on Wednesday, the WWE Leaks website indicated that brand new odds were released for the Triple Threat title match via Paddy Power sportsbook. The Irish betting website is currently closed off to those in certain countries, including the United States. 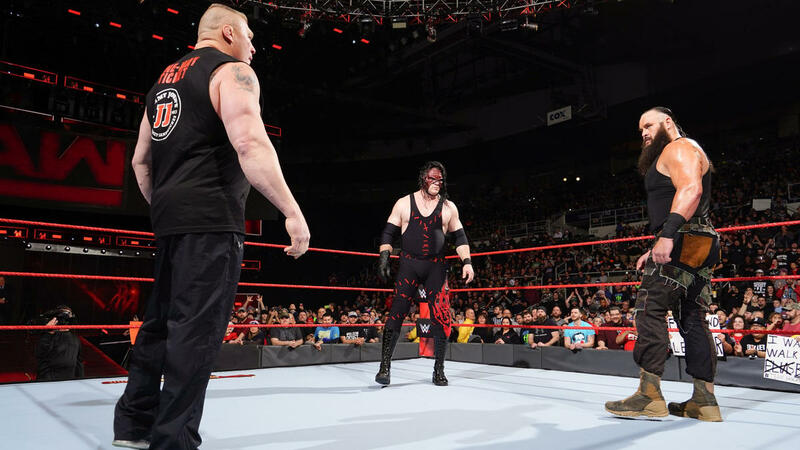 However, WWE Leaks revealed that Braun Strowman is a 3 to 1 favorite to win the match, while Kane is more of an underdog at 10 to 1 odds to emerge as the big winner. For Kane, it could very well be his last appearance at the Royal Rumble pay-per-view for his legendary career as he turns his attention towards his political aspirations. As far as the current reigning champion goes, Brock Lesnar is the favorite heading into the match. Paddy Power has given him odds of 1 to 5 to retain the WWE Universal Championship. That means that bettors need to put up $500 just to win $100 on Brock if he wins the match. In the other two situations, a bettor could put $100 on Braun Strowman and win $300 if he wins the match, or put $100 on Kane and win $1,000 if he is the winner. As of this report, Brock Lesnar’s current title reign has spanned over 282 days, dating back to his win over Goldberg at last year’s WrestleMania 33. It’s expected he’ll carry the title into this year’s edition of WWE’s “Super Bowl of professional wrestling” giving him a one-year reign with the title. That would make “The Beast” the longest-reigning champion in the short history of the Universal title. Most fans and wrestling journalists are expecting that Lesnar will drop the title on “the grandest stage of them all” to Roman Reigns, who continues to receive main event treatment from WWE’s top decision makers. At that point, it’s unknown if Lesnar will officially leave the WWE for another hiatus, or even consider retirement. It’s always possible he’s contemplating a return to the Octagon for some more UFC fights. The WWE Royal Rumble 2018 pay-per-view will take place on Sunday, January 28. Fans will be able to see if Brock Lesnar leaves as the Universal Champion, or if Braun Strowman or Kane shock the WWE Universe.